When I moved to Bristol in 2002 people still talked about Finnegan’s Wake on Cotham Hill. I would say that I’d had a drink and eaten a pizza at The Hill and Bristolians would nod and say ‘Ah, you were at Finnegan’s Wake.’ The Hill was new, you see. For years locals still called it Finnegan’s, with a sort of lazy obstinacy. It was odd, because no one had any affectionate memories of the old pub; it was a nondescript Irish theme bar, notable only for being named after Joyce’s vast unreadable novel. In fact, during my fifteen minutes’ research for this, no one I asked could recall anything about it: ‘I don’t remember, there were probably some Irish props scattered about the place and some old-fashioned signs and agricultural implements on the wall’. Perhaps this isn’t so strange, though, in my home town you could tell someone’s age by what they called the now defunct local nightclub, which passed from The Aquarius through Reflections to Starlight, which is to say from the 1980s into the 1990s. People don’t care for their landmarks changing. The Hill installed open plan pizza ovens and served lesser-known imported lagers and bitter that wasn’t only from corporate breweries. You would sit on low leather sofas or high stools. The pizza was generally good, though there were a few rum combinations, like the one with Hoi Sin-slathered duck and spring onions—just as people often want their friends to like their other friends, they seem to want their favourite ingredients to get along. But novelty grows old quickly. The experimental pizza caper has shifted from fusion to the artisanal, meaning less crude grabbing at the crotch of international novelty and more local ingredients and hipster neo-trad; Chinese pizza seems sadly dated—smoked Dorset blah blah with West Country chipolatas and goat’s etc is what we want, and as for the furniture, it’s all scrubbed wood and beer kegs now. Then there’s the beer: Peroni’s all very well, but where’s the craft stuff? It wasn’t just falling out of fashion that hurt The Hill, of course, it was also the the decline of sports watching in pubs (they’d grown into this side of things over the years) and, most of all, it was the students. Five or ten years ago a place like The Hill would be full of students swilling their gullets out with strong lager on match day, and often enough all day over any weekend outside of exam time. Watching, say, rugby internationals there over the last couple of years, they still cram in, but they drink very little; some make a beer last the full game, some drink soft drinks and many, and I mean many, don’t buy a drink at all. I’ve been in other local pubs during a match when staff have asked students to either buy a drink or leave. I don’t love drunk students very much, but I hate sober ones in a pub. They seem like dull dogs, this generation, and if you say it’s because they’re poor on account of their giddy fees, they’re not poor in these parts, they can buy and sell us working stiffs. I’m not sure what it means, but abstemious students is a portent of some kind and I fear for the future of the country, not just pubs like The Hill. 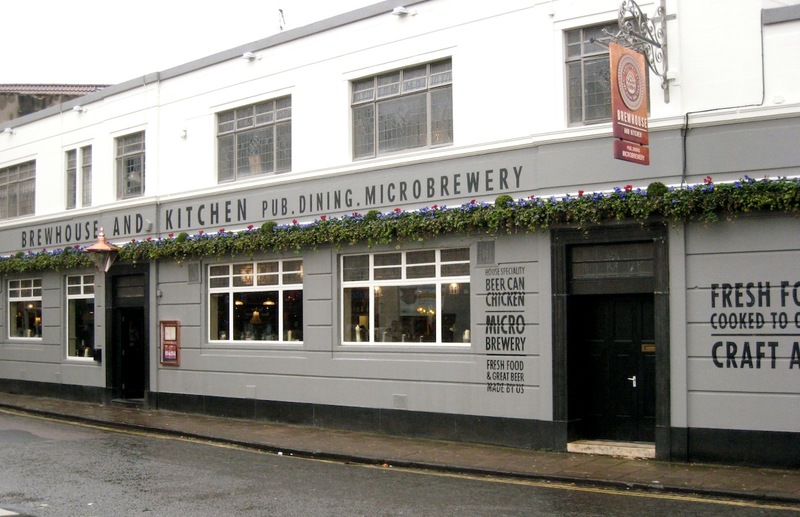 In January The Hill closed, reopening in March as Bristol Brewhouse and Kitchen. It’s a microbrewery; they have craft beer and cider; they serve contemporized British and American classic food with a bit of international this and that; they have ‘vinyl nights’ where you can listen to your records with like-minded folk. There’s faux-rustic fittings, all that biznai. It seems a nice enough place and I wish them well, I even like many of these things— would hanker after them as a young fogey back in the day—but if you stood on Bristol’s King Street on a quiet afternoon and whistled you could be heard in at least three similar pubs. Fifteen or twenty years ago you could say something similar about Irish bars; now only two are left in central Bristol. Let’s hope Brewhouse lasts long enough for people to stop calling it The Hill, or ‘that place that used to be The Hill‘. And that they have plenty of customers who aren’t in full-time higher education. In other news, I see my old Windermere local is closing. Not because it went out of fashion, it never was in fashion, but because the seemingly ageless landlord—affable, unobtrusively eccentric, engaged in a long war against a series of brewery area managers who wanted him to serve food—retired at last and the new people couldn’t keep it going. He hated and resisted innovation, holding out against refurbishment of the comfortably drab interior for as long as he could. In his way, he was a great man, and he served good, well-kept beer in the best of pubs, where homeliness and the drunkenly surreal somehow combined. There aren’t many places you’re likely to see three middle-aged men marching on their knees at 3 a.m. on Boxing Day morning, singing ‘Heigh ho, heigh ho, it’s off to work we go‘. I just looked the pub up online and there were two Trip Advisor reviews, both hostile. (No website, of course, it wasn’t that sort of place.) The last said ‘Local dive for local people … the only good thing about this place is the fact it’s closing down.’ Ah well, he was only a tourist and almost certainly a prig (writing ‘as a CAMRA member’), so to hell with him. We liked it and Windermere will never be quite the same again. The Windermere sounds a proper place for a beer and a chat. Love places like that. Windermere’s the town, Michael. But the pub (the —) was one of the best. All beer and chat, no food or flash stuff. An old-fashioned drinking pub.